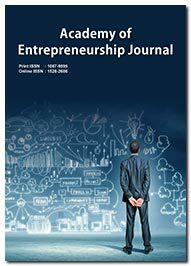 Academy of Entrepreneurship Journal (AEJ) is a peer reviewed open access journal affiliated to allied Academy. Sponsored by the professional bodies like the Academy of Entrepreneurship, the journal adheres to a stringent double blind peer review policy. 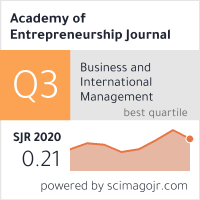 With an acceptance rate of 30%, AEJ considers theoretical, conceptual and empirical studies in entrepreneurship and small business management for publication.The journal caters to the needs of wide range of readers like B-schools, small and medium business entities, industries, policy makers, researchers, scholars, academicians and students. To this extent the journal encompasses a broad spectrum of topics in this field for publication, including but not limited to Strategy and entrepreneurship, nascent entrepreneurship, global entrepreneurship monitor, female entrepreneurship, business model evolution,Latent entrepreneurship, global entrepreneurship monitor, entrepreneurial spirit, small business owner-manager, small and medium enterprises, industrial policy and sectoral choice, entrepreneurial heuristics, entrepreneurial Spirit, Small business and economic growth, Nascent and start-up entrepreneurs,New venture creation process, organization, and behavior family business, Managerial characteristics and behavior of entrepreneurs,start-up entrepreneurs, customer relationship management, consumer behavior, E-Commerce and E-Business Models. More information on the types of manuscripts published and the categories of research accepted are displayed in the Journal Matrix section of this website. Authors who would like to discuss the potential interest in a manuscript may contact the Editorial staff.